You may read all over the internet and social media how wonderful water jug challenges are for your health. You probably already know that you should be drinking more water but maybe you just don’t get the point of drinking water all day long. That is alright. Today you are going to learn a bit more about the basics and reasoning behind a water jug challenge. Tip: Base the times following the length of the time after the first. You will first be advised to do the morning chug. 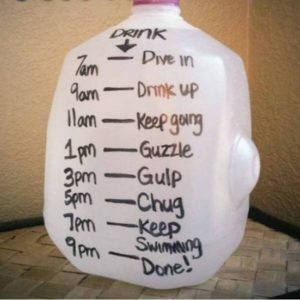 You should do this section of the water jug challenge between 7 and 9 a.m. or within 2 hours after you have woken up. This is extremely important. It clears out your system early on in the morning and helps to boost your energy so you can start your day as well. The mid-morning chug will generally be listed as between 9 and 11 a.m. This is the time where you are getting started through your day and you need to push yourself into the lunch rush. You need to make sure you stay hydrated and energized and this mid-morning chug of water is going to help you do that. There is also the mid-day chug which is generally recommended between 11 a.m. and 1 p.m. This time of the day is around lunch time or just before lunch time. You may be getting hungry. However, eating a meal now would mess with your entire day’s schedule and cause many nutritional issues. If you are hungry grab a handful of nuts to hold you over and drink your mid-day chug of water. The early-afternoon chug is generally recommended for between 1 and 3 p.m. You have finished your lunch or are just eating lunch. You need to rehydrate so you can boost your metabolism and energy for the rest of the day. One of the best ways to do this is through a good chug of water. Don’t stop now because you are almost there. You should also do the late-afternoon chug. This one is generally recommended to drink between 3 and 5 p.m. This is right before you will be eating dinner and again you may be getting hungry. You can grab another small but healthy snack and drink this section of your jug. The evening chug is another one that you should not miss out on. This is going to be consumed or should be consumed with your dinner and a bit just before your dinner. This will assure that you do not overfill yourself or overeat during dinner. Many water jug challenges will have you separate the jug all the way to 11 p.m. However, making yours last 12 hours is the best option and is easy enough.